FREE Gold Over Glitter Silver Hoop Earrings! You are here: Home / Great Deals / Christmas Deals / FREE Gold Over Glitter Silver Hoop Earrings! Sears has these Gold over Glitter Silver Hoop Earrings on sale for $9.99 (Reg. $50) and you can get back $10.09 in Shop Your Way points, making it FREE! Plus you can get FREE in-store pick up or FREE shipping on orders over $49! 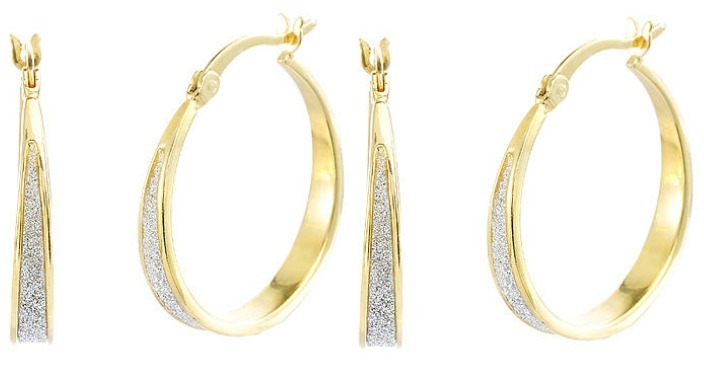 The Gold-Plated Hoop Earrings with Glitter add flair to your jewelry collection. Each earring features a gleaming strip of glitter against a polished, gold-plated finish to make any outfit stand out. The dangling design and glitter create a stunning glow to accentuate clothing and facial features. Put the pair on before a formal outing with friends and family, or wear them with business casual clothes for work. This chic pair of earrings are perfect for all occasions. Final: FREE PLUS FREE shipping on orders over $49 or FREE in-store pickup!